The #1 best-selling e-book is now available as an expanded-edition hardcover. Now with two additional chapters, this first printed edition of Summer’s Path by DailyOM co-founder Scott Blum presents the remarkable story of Don Newport, an engineer who comes face-to-face with his personal destiny under extraordinary circumstances. After losing his job and his health insurance, Don learns that he has a terminal disease, with only a few months left to live. On his deathbed, he meets Robert, a brazen angel of death who promises to help him with a graceful exit. As Don prepares to say his last goodbyes to his loving wife, Robert attempts to change Don’s perspective about his mortality and proposes an exceptionally unique option. 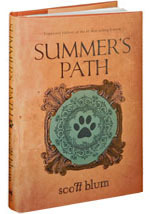 Summer’s Path is the prequel to the best-selling book Waiting for Autumn. Are you aware of the individual and collective role that the subconscious mind plays in the law of attraction? So many people have attempted to change their life circumstances through positive thinking, visualization, and affirmations only to find themselves right back where they started…in pain, afraid, and overwhelmed with stress. In Dr. Darren Weissman’s latest book, Awakening to the Secret Code of Your Mind, he reveals the 1-2-3 PLAN of The LifeLine Technique™, a simple 10 minute process that will help you to begin to live your life with passion, purpose, and intention. Imagine your life where symptoms, stress, and disease were nothing more than a conversation, a running dialogue stemming from your subconscious mind. In this book, you’ll discover the key to unlocking the ‘secret code’ that translates and transforms pain into power, fear into courage, and stress into knowing. The LifeLine Technique™ has been hailed by Louise L. Hay as “The wave of the future…” and is endorsed by the leading conscious visionaries of our time. Gregg Braden’s compelling forward sets the stage for the crucial timing of this books message. Infinite Love & Gratitude to this extraordinary roadmap guiding humanity through a transformation of epic proportion…the journey of creating world peace through inner peace. Dr. Darren R. Weissman is a practicing holistic physician and the best-selling Hay House author of The Power of Infinite Love & Gratitude. He’s a leading authority on the subconscious mind and the developer of The LifeLine Technique™, an advanced holistic system that gets to the source of all symptoms, stress, and disease – emotions buried within the subconscious mind. He’s helped thousands of people awaken to their power to shine and thrive. Purchase this fascinating book April 7, 8, 9 or 10 and receive valuable gifts (worth $18 – $1466) from Dr. Weissman and additional gifts from his partners including Dr. Wayne Dyer, Gregg Braden, Collette Baron Reid, Sandra Anne Taylor, Lauren Mackler and many, many more. Click on the link below to view a video by Dr. Weissman, read endorsements, purchase the book and redeem your gifts.